Eliza in My Fair Lady struggled to get her pronunciation perfect. There are others out there who need to do the same, and one of them called me recently. Either that or my voice mail didn’t pick him up very well. It sounded pretty clear though, so I’m going with my original interpretation. I haven’t been secretary of the association for two years now, but that’s okay. I don’t mind taking calls and referring them on to the appropriate person, which is what I did. I called the current secretary and left her a message; she called the president and left him a message. Is this beginning to sound a little like the old “Telephone” game we all played as kids, only with answering machines added? The president called the guy back and set up the time to speak, which was at tonight’s quarterly dinner. We were treated to a half hour presentation on modern methods of raising hogs, given by a public affairs representative from the state’s PORK Commission. He came complete with movie interviews with farmers, showing the inside of the buildings where the piglets are born and the buildings where they are “finished.” That means raised to market size, not slaughtered, although the specter was always there. He talked about the feed, the cost, disposing of the manure, etc. We had just eaten a dinner of barbecued pork, and he was talking about the “dung slots” in the floor of the buildings. Some of the trustees are farmers and really enjoyed the program. I got a nice little cookbooklet out of the deal. What’s Up With The Media? Barack Obama is beginning to get a little negative press. What’s up with that? The local newspaper, a Democrat Daily through and through, even ran an article mentioning his incessant flip-flopping and seeming lack of core principles. Lack of experience has been parleyed about for awhile now, although usually with a discliamer either excusing him for it or heaping scorn on anyone who would notice. Heck, there have even been a couple of editorial cartoons making jibes at him. He gives us nothing but words like “hope” and “change,” words that mean nothing on their own, and without details on what he means by them. Until you go to his website, where some of the hard, hard left ideas begin to surface. I’ve seen a couple Main Stream Media references to the name Tony Rezko, and even one on Obama’s dealings with Rezko to get grants for subsidized housing. It wasn’t flattering. It even mentioned old-time Chicago politics. They’re finally beginning to touch on things that have been known for a long time through public record requests, but it is such a tentative dipping of the toe into the muddy waters. Will the MSM really do this to the anointed one? So far they have let others do the investigative journalism, then ignored what came up. The MSM has been deep in the tank for him and too protective of their candidate. So, how come now there are cracks appearing in their wall of silence? Tiny cracks, for sure, but there are a few. Are they trying to make a smoke screen of deniability for their partisanship; are all the stories from Obama’s past reaching critical mass; or are they actually starting to develop a conscience? Just asking, you know. If I were a betting person, my money would go on choice #1. I found these articles about Obama informative; have you heard any of it from the MSM? I don’t know how accurate they are, but they appear to be well researched. If you read them, start at the top and work down so you understand the terminology and inner workings between the players. They are long, but deciding who to vote for to be the next president deserves some time and consideration. It takes a lot of courage determination confidence to marry a man with four children, with the intention of not only being a wife but also of making a difference in said children’s lives. I am so impressed with my new daughter-in-law. Lolly is asking about their strengths and weaknesses, speculating on causes of past problems, expressing her concern for their well-being, and planning strategies for helping them in the future. I cannot say God-send enough times to describe her. As we sat at Drew’s house celebrating his birthday I could only think that Doug has a complete family for the first time. It was wonderful to watch them, to see the considerate interaction between them which was missing in his previous marriage. I can only say, God does answer prayers. Happy Birthday, Drew. Can it really be 25 years since you were born, so big you filled the hospital bassinet at birth? Seems like just yesterday. Now you’re married with a baby of your own, starting your first real job as an accountant. Wow. Time flies when you’re having fun. Here’s to your future, with wishes that your life is as full and rewarding as mine has been (so far – I’m not giving up yet). * The answer is, ten pounds, eleven ounces. He remembers. I definitely remember. With no segue, on to today’s litany of events. I spent this afternoon working on Tim’s computer at the township office. It has been running like a dog and he took the day off, so figured I could waste some time defragging it, running virus scans, wiping out temporary internet files, etc. Those are the things you do to make yourself think you are accomplishing something, when in reality none of it helps. A stop by my favorite ice cream shop lifted my mood. I was on the way to check on four complaints of businesses being run out of residences with the outsides looking trashy, and the ice cream siren song was just too loud to ignore. Black cherry in a waffle cone. When I got back to the office I checked how much RAM that problem computer has, and, well, 512M just won’t cut it anymore. Probably should have checked that in the first place. It’s not that old, and it worked fine when we first got it, but downloads and updates must have put a little too much into its memory banks. Bud came up and helped me crack it open to find out what it needs; I’ll upgrade it Monday. Matt called to ask about berries he found on trees along the creek while taking a nature walk with the kids. Hmmm. Do I dare make a decision without seeing them? Am I endangering my grandchildren’s lives if I make the wrong call? I diagnosed them to be mulberries and told him they were edible, so they all tried them. Gee, I hope I was right (just kidding). The black berries he found on thorny bushes nearby must be black raspberries, based on the fact there are ripe black raspberries in my back yard and blackberries come in later in the season. Even A~, who doesn’t like fruit, was trying the berries, which is a good thing. I ended the day striking out the second time trying to fill yesterday’s prescription from the doctor. She decided my four years of gastric pain has been caused by h. pylori bacteria, but instead of writing prescriptions for the separate antibiotics used to treat it she wrote for some package deal. This is not looking promising. You know h. pylori, the one that causes ulcers. The generic antibiotics required to treat it are just amoxicillin and clarithromycin, and you take them with Prevacid in this case. The individual antibiotics are dirt cheap, but my guess is the package deal won’t be. Here’s to modern medicine, which cures you but doesn’t make it easy. …What is unique about this situation is that it was a large eruption that went completely undetected, and under pressures that they thought not possible. The big question is then; where did the heat from the volcano go, and what effect did it have on the sea ice environment? Research has been going on looking at volcanism in the ridge but this discovery of a significant eruption in 1999 is new and unexpected. Hmmm. What do you suppose the chances are that the pyroclastic flow and heat from the volcanoes has at least some responsibility for any melting that might be going on in those environs? Especially since the atmosphere hasn’t warmed any in the past ten years. Just a thought; keep driving that SUV. *Those pictures of a polar bear stranded on an ice floe are bogus – they were taken of a bear swimming out to a floe near land, then back again. The swimming part was edited out. Here is a movie about a polar bear that is just as authentic. Hmmm, where to start. I guess the beginning is as good a place as any. My day started with a 6:30 a.m. appointment for some routine medical diagnostics. Let’s just say because my father died of colon cancer I am supposed to get checked every five years. I waited six years this time – some things you just don’t rush into. The doctor also did an endoscopy to check for gastritis at the same time, since I’ve had problems before and there’s no use wasting a good anesthesia-induced sleep. All is well. And if you should be getting yourself checked out don’t hesitate. The day previous is a little rugged, but the procedure itself doesn’t last long and you’re asleep anyway. I didn’t even see them hook the line into my IV, let alone start the anesthesia. I’m not supposed to drive for the rest of the day, or make any legal decisions, or do anything of importance since my thinking might be impaired from the anesthesia. Uh, right. That feeling lasted for about 15 minutes. An hour’s nap and I’m back to normal, or at least what passes for normal for me. Drew called later this morning and put four of us on a conference call to plan Saturday’s dinner to celebrate his birthday. That’s not a legal decision and probably isn’t of earth shattering importance, so I went ahead and helped plan the party. Planning birthday parties is pretty routine , what with 24 people in the family and birthdays popping up fairly often. What was amazing was that he knows how to put us all on a conference call on a cell phone. I need to have him show me how to do that. I know, I know….I’m showing my ignorance again. I’m going to a zoning hearing at 2:00 this afternoon to support residents who don’t want to see a small trailer court get permission to expand. There have been problems with what is there and they don’t want to see it enlarge. I’m getting a ride, so don’t worry; I will follow the doctor’s orders not to drive. The nurse told me I might fall asleep if I went to a meeting, but I think this one will be too raucous for any napping. The BIG NEWS of the day is (drumroll, please) Doug and Lolly are closing on their house at 2:30 this afternoon! Yay!!!! They are already talking about window treatments and furniture placement, so all they need now are the keys, a truck, some boxes, and some time. Oh, and Lolly’s furniture to arrive from out west. That will be in mid-July, so they will have time to move incremenatlly, which will probably make the process a little easier. I am so excited for them. Doug said Lolly sees the layout of the rooms differently than he does, with the computer in the back room and the front room used as a formal sitting room instead of the other way around (I agree with her 1,000%, by the way). Anyway, I like what he said next. “I will just have to keep talking to her about it until she decides to see it her way.” I heard her laughing in the background. He was excited that when they went grocery shopping last night Lolly complained about the cost of a jar of olives. She said it was 20 cents more here than out west. She watches prices and tries to save money! Oh, joy! He knew she was like that, but to go shopping together and see it in action warmed the cockles of his heart. She will be a good wife. And that’s the news from my little corner of the world. Township meeting tonight. Our deputies need new computers. They know what they want – let’s call them “Brand T” – and won’t accept another brand. What they want costs over $3,200, and isn’t in our budget. What really made me mad was the request Mr. Trustee had from the deputies, comparing the prices of the two brands. “See, they are only about $1,200 apart in price, and our deputies deserve the best,” he intoned. He didn’t understand they weren’t comparing apples to apples. They speced out two totally different computers. “Brand T” came with an 80 GB hard drive, 2 GB of RAM, and a 13″ monitor. They compared that to “Brand D” with a 160 GB hard drive, 3 GB of RAM, and a 15″ screen. Oh, and for good measure they added Office 2007 to the one they don’t want, to inflate the price a little more. They didn’t add it to the other one, though. “Brand D” still came in under $2,000. I am tired of wasting time. I am tired of listening to him bloviate. I am tired of being treated like a woman who doesn’t know her place. We finally voted to buy the less expensive hardened ones, but not without that inevitable “NO” vote from the other end of the table. I speced it out online later this evening at $1,412, including the daylight-readable TFT screen. Township trustee pay may only be a pittance, but I take the job seriously and have a reputation for being the hardest working trustee among the 30 in our county – that’s three each in ten townships. Just ask one of the county commissioners, the one who tells everyone how hard I work. I used to think he was just blowing smoke, but eventually came to realize he is dead serious. I really earned my pay today. Every month that has five Mondays we have a joint meeting between the local school board, the township officials, and the manager and city council of the small city located within the township. It involves a dinner, and this month was our turn to host. Read that as I fixed dinner for 25 people politicians. Wait, you say. This is only the fourth Monday of the month – next week would be the fifth one. You would be right, but the county township association holds a quarterly meeting on whatever day happens to be the fifth anything of the appropriate month, and it also fell on Monday this quarter. So, we bumped the other meeting back a week. See? Next week is the county township dinner, where I will go merely as a guest. Anyway, since it’s summer and we assumed it would be hot we planned a salad buffet. It turned out to be a nice day, but due to the failure of global warming it was only in the 70s and we could have fixed anything. Whether out of dedictaion or ennui, I didn’t bother making alterations but forged ahead with the original plan. I spent the morning shopping, the afternoon preparing, and the evening at the meeting then helping clean up. Thank heaven for the township administrator who helped set up and clean up the place, aided on clean up by the other elected officials. By then I was pretty worthless. We had chicken salad, ham salad, potato salad, frog eye salad*, green salad, fruit salad, and a veggie tray. Very healthful. I ruined it with potato chips and blueberry buckle** though, but who cares. Tomorrow we are eating leftovers at lunchtime at the township office for anyone who wants to drop by, which includes the state auditors currently going over our books, the county commissioner who dropped by this evening and stayed to talk for an hour after the meeting, and the congressional chief of staff he will be ushering around tomorrow. “You need to get on the good side of him and stay there,” the commissioner said. Unfortunately, after I drop the leftovers by the township tomorrow I won’t be staying for lunch and meeting the congressional chief of staff. It is my monthly lunch with some friends from church, and that takes precedence over politicians. There are usually three or four of us, sometimes more, and we get together just to enjoy one another’s company and catch up on what is going on in life. A little relaxation therapy. Everyone needs a few good friends, and they are some of mine. *No actual frogs are harmed in the making of frog-eye salad, a favorite in my family. It is made with acini-di-pepi pasta, fruit, cool whip, and a few other things. **Blueberry buckle probably ranks #1 on my family’s list of favorite recipes, and I often make it for Sunday dinner when everyone is coming over. It is cake-like with lots of blueberries and a streusel topping. I tell myself it is a health food because of the anti-oxidant properties of blueberries, so don’t go bursting my bubble. Recipes are available on request. They’re probably also available with a Google search. Drew made it home last night, driving his 22-year-old van , towing his car with almost 200,000 miles on it, and looking like some refugee from a Depression-era book. His father-in-law helped with the drive, and they did it straight through. Yikes! Drew bought the van specifically for the trip, since he and Kelli don’t have much furniture and they wanted to move themselves. The van was inexpensive to buy but expensive to operate (go figure, at the age of the van and the current cost of gas), but he figures he can resell it and recoup at least part of the cost. Either that or be the most popular person in the elders quorum when people are moving in the ward. The van came with a cargo wall that could be installed behind the front seats. With that in place they were able to pack it – and I do mean PACK it – to the ceiling. The cargo wall looks like it had a door in the center that has been welded shut, like maybe at one time it was for a paddy wagon, or some other use that would require separating the driver from the passengers in back. 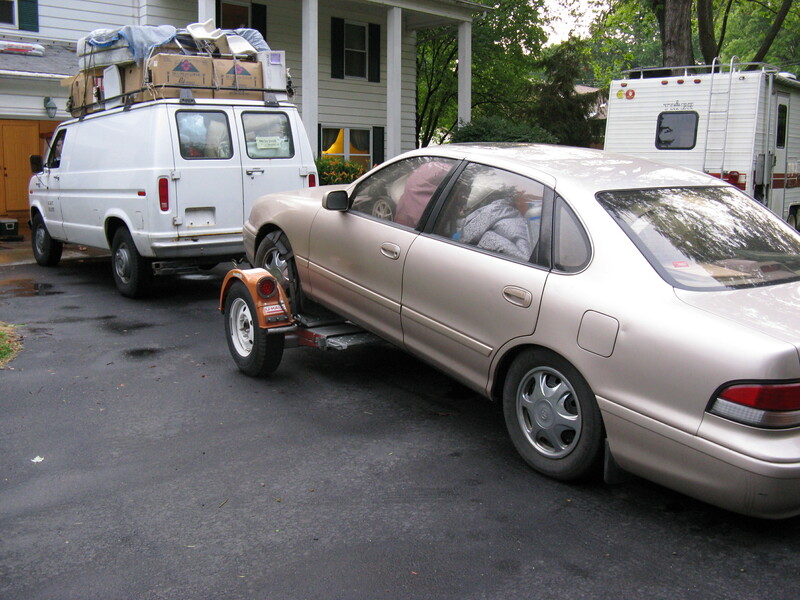 Anyway, they had the car packed, the van packed, and things strapped to the top – several layers deep. The van carried a leather love seat, a bed, a crib, a platform rocker, various and sundry boxes of kitchenware, books, clothes, household items, sporting goods, and, of course, his climbing wall. As in a practice wall for rock climbing. As in – WHAT? With limited space you brought WHAT? As Kelli explained to her mother, you can replace your end tables (which she sold there and has already replaced here, with ones nicer than she had before) but how often do you find a used rock climbing wall you can afford? That was the one thing they decided they couldn’t leave behind, since Drew loves rock climbing and, well, what can I say? There are no mountains in this area. Not even many hills, which you would just walk up and down anyway instead of climbing with gear. He wants to stay in practice for the times he does go on an excursion and find a place to do what he loves. There are places like that within reasonable drive time, even in the flat midwest. Besides, he will be every kid’s favorite uncle with that thing set up in his basement. All he needs now are gym mats for the floor, to keep the kids from killing themselves. I came back from Drew and kelli’s last night dog tired, It was almost midnight by the time I pulled in the driveway, and my right hand felt like a claw from holding a paint roller for so many hours. We got the living room, dining room, kitchen, bathroom, and half bath done though, and felt pretty proud of ourselves. One bathroom to go, but I won’t be there for that one. I got up early today to help at the township cleanup day – for five hours. We had plenty of volunteers, plus four jail inmates who helped unload stuff out of people’s cars and trucks. There are always a few doubletakes when people drive up to the dropoff area and see the bright green shirts stenciled with “Jail Inmate” on front and back. The inmates they send are always very polite though, and very helpful. Lots of people showed up to fill dumpsters with construction debris, old furniture, scrap metal (not as much as in past years, since many people now take it to recycling centers and sell it), and all other sorts of junk. We had to redirect a lot of people since they had tires and the dropoff point for those was at the high school. All in all a very successful morning though. Now I have a trunk full of topsoil and mulch and am getting ready to head back to Drew and Kelli’s so Bud and I can help unload the van when they arrive in a couple hours. I want to plant some petunias out front (thus the dirt and garden implements), and Bud is going to try and fix a leaky toilet. I will take a picture of the van they are driving cross country, which Kelli says is very Beverly Hillbillies. It is old, rusty, and says Salt Lake City School District on the side. Their car is in tow behind it, and furniture is strapped to the roof. Wow. My very frugal son. I’m not sure whether to be proud or to hide my head. I can’t wait to see them, and to have our first family reunion with everyone living in the same state.